Craftin' Caro: Faux Bargello challenge! This week I'll be teaching the attendees of my "Time for Techniques" classes a really fun technique I call Faux Bargello. It is a technique that is often used in quilting and I've seen (and made) the same with paper scraps for my cardmaking but BOY, is it ever a tediously long process. "The basic "recipe" of the Bargello is to glue down strips of color in gradiating hues (for example, light blues to medium blues to dark blues). You can do this with one color or several colors in one piece. Once all strips are glued down, butted against each other, the piece is turned a 1/4 turn and new strips are made by cutting across all of the colors in varying widths from fat to skinny. These are then arranged on your surface alternating thin and fat strips and moving the strips up or down with each added strip to create a movement. 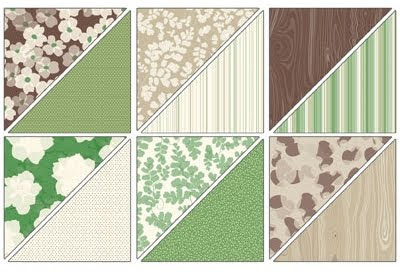 Because I was looking to create a St Patrick's Day card as one of my examples, I was going to need some greens in my papers...thus, Woodland Walk Designer Series Paper! It uses Garden Green and Wild Wasabi as well as Very Vanilla, Crumb Cake and Chocolate Chip. I already had the individual Lucky Shamrock stamp from the Occasions mini catalogue, so this was the perfect opportunity to use it! So, my challenge to YOU all is...create a Bargello card of your own using striped paper. You can send me a photo, or direct me to the link on your blog if you have one, but I'd love to see what you come up with on your own! You're welcome to join me on Wednesday or Thursday for this fun class. As well as the Faux-Bargello technique, you'll also learn how to do Polished Stone, stamping on candles and the Baby Wipe techniques. RSVP to hold a spot!